Many high school students overlook community colleges when considering higher education. According to the Community College Research Center, 8.7 million students attended community colleges in 2016-2017. 34 percent of all undergraduate students attended school at the community college level. Why are community colleges worth a serious look in today's higher education marketplace? Why consider a community college instead of a four-year college? Certainly, cost is one factor. According to the College Board, the average tuition for in-state students at public two-year colleges (the typical community college) for 2018-2019 was $3,660, while public four-year colleges charged $26,290 and private colleges had anaverage tuition cost of $35,830. In addition, over a dozen states now offer some form of free community college education. Another compelling reason to consider community colleges is the rapid rate of growth anticipated in occupations requiring an associate's degree - the degree typically offered at community colleges. The Bureau of Labor Statistics forecasts that associate's degree jobs will grow by 17.6% by 2022, while bachelor's degree jobs will grow by 12.1%. Income level is yet another reason to consider a community college degree. According to the Bureau of Labor Statistics, two-year college graduates earned an average of $42,952 as of the third quarter of 2018, while high school graduates earned an average of only $38,272. A major reason for the relatively high growth rates and income levels of community college jobs is the specialized nature of many of the degrees. Community college students often study disciplines in which they develop skills that are readily applicablein the marketplace. The vast majority of the highest paying associate's degree jobs (and those with the highest projected growth rates) fall into three categories: healthcare, engineering and other areas of technology. All of these segments are experiencing an above-average expansion in employment opportunities due to economic trends. 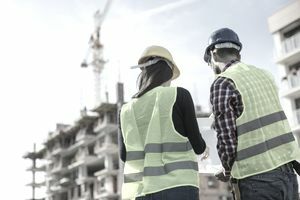 Construction managers attracted an average salary of $91,370 as of May 2017, but keep in mind the fact that they usually had acquired several years' construction experience in conjunction with their degree. Construction manager jobs are expected to grow by 11% by 2026. However, construction is a very cyclical field where opportunities will fluctuate greatly betweenperiods of economic expansion to recessions. Diagnostic medical sonographers vacanciesare expected to experience growth of 23% or higher by 2026, with an average income of $55,270 as of May 2017. Dental hygienists jobsare expected to grow at a much higher-than-average rate of 20% by 2026. On average they earned $74,070 as of May 2017. Registered nurse roles and radiation therapist jobs both are slated for growth rates between 13-15% by 2026, with average salaries of $70,000 and $80,570 respectively,as of May 2017. Opportunities for veterinary technologists and technicians are expected to expand 20% by 2026, with an average salary of $33,400 as of May 2017. Vacancies for environmental science and protection technicians and environmental engineering technicians are both expected to grow 13-15% by 2026. They garnered average salaries of $45,490 and $50,230 respectively,as of May 2017. Civil engineering technician jobs are expected to grow by an average of 9% by 2026 and had an average salary of $51,620,as of May 2017. Geologic and petroleum technician jobs are forecast to expand 16% by 2026. They had an average income of $54,190 as of May 2017. Jobs for funeral directors are expected to increase 5% by 2026 and attracted an average salary of $56,850,as of May 2017. Paralegals and legal assistants can expect job growth of about 15% through 2026. The average salary for this field was $50,410 as of May 2017. Jobs for web developers are suggested to expand15% by 2026 and they attracted an average salary of $67,990 as of May 2017. Respiratory therapists and radiologic technologists are predicted to experience job growth of 23% and 13% respectively by 2026 and earned average salaries of about $60,000,as of May 2017. Physical therapy assistants and occupational therapy assistants are expected to experience job growth of 29-31% by 2026 and had average salaries of $57,430 and $59,310 respectively,as of May 2017. For more information on these jobs and for information on other career options flowing from a community college degree, consult the Occupational Outlook Handbook.